Stratovolcanoes (also known as composite volcanoes) are what most people associate with the word volcano. These towering peaks rise hundreds to several thousand meters above their surroundings, often visually dominating the landscape around them. As their name implies, they are formed of stratified layers of both viscous lava flows and fragmental material. Classic symmetrical stratovolcanoes such as Shishaldin in the Aleutian Islands and Mayon in the Philippines are the exception rather than the rule. Most stratovolcanoes are complex structures formed by multiple eruptions from summit and flank vents. Compound stratovolcanoes may form when the focus of eruptions shifts, forming multiple overlapping edifices. Some stratovolcanoes may form in a few thousand years, but may remain active for tens to hundreds of thousands of years. During their lifespans, dormant intervals may also last tens of thousands of years. Perhaps the most common rock type of stratovolcanoes is andesite (named after the Andes Mountains), but stratovolcanoes form in a wide variety of tectonic settings and erupt a wide range of rocks. Their steep-sided profiles are often exaggerated even further by artists for dramatic effect. Slopes of stratovolcanoes rarely exceed the angle of repose for fragmental material at about 30-35 degrees, and eruptions from multiple vents often produce complex volcanoes with greatly variable morphology. Early November snowfall at Haku-san accentuates the volcano's name, which means "White Mountain." Eruptions at multiple vents along a roughly N-S line give the complex stratovolcano an elongated profile; the volcano is viewed here from the west. 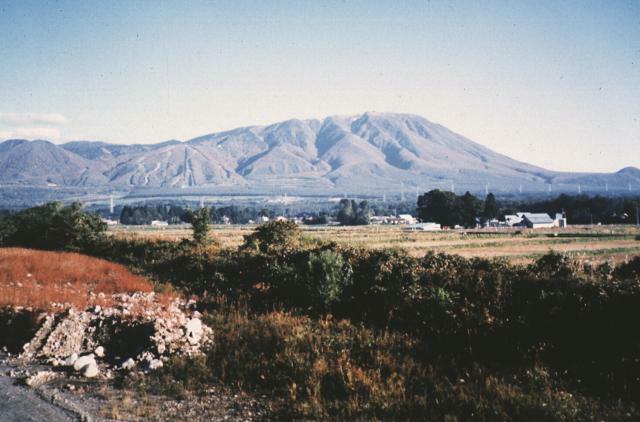 Holocene eruptions have consisted of phreatic or phreatomagmatic explosions from several summit craters. Historical eruptions were recorded over almost a thousand-year period until the 17th century. 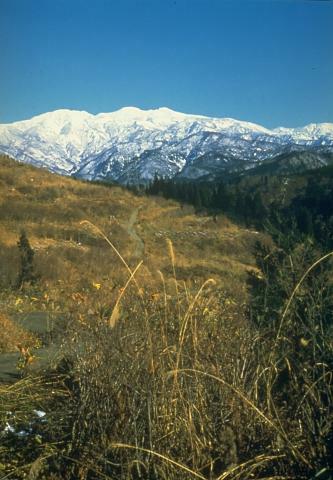 Photo by Ishikawa Prefecture, 1983 (courtesy Toshio Higashino, Haku-san Nature Conservation Center). Seen from the SW, Iwate stratovolcano on Japan's northern island of Honshu, has an elongated profile. The extensively dissected Onogajo volcano forms the older, western part of Iwate and is truncated by the 1.8 x 3 km Nishi-Iwate caldera. The smoother slopes at the right are formed by ejecta from the younger Yakushi-dake cone, which was constructed on the eastern rim of the caldera. Photo by Hidenori Togari, 1994 (Hokkaido University). Symmetrical Klyuchevskoy volcano, seen here from near the site of the Tuila eruption on its north flank, has had more than 100 flank eruptions during the past 3000 years. 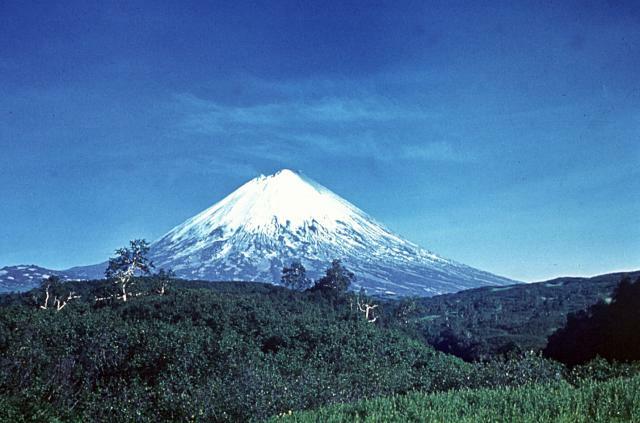 The conical basaltic stratovolcano is one of the youngest and largest of Kamchatka's volcanoes, having produced 300 cu km of material since the early Holocene. 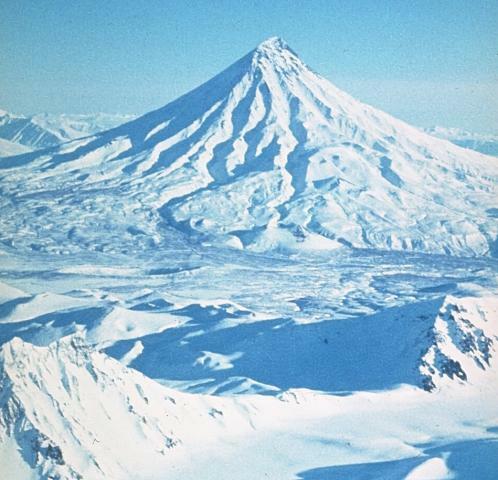 Its extremely high magma-production rate has created Kamchatka's highest volcano in only 6000 years. Photo by Vera Ponomareva, 1976 (Institute of Volcanic Geology and Geochemistry, Petropavlovsk). Mount Baker stratovolcano in the North Cascades rises 1500 m above a dissected basement complex of metamorphic and sedimentary rocks, exposed at Dock Butte in the foreground. 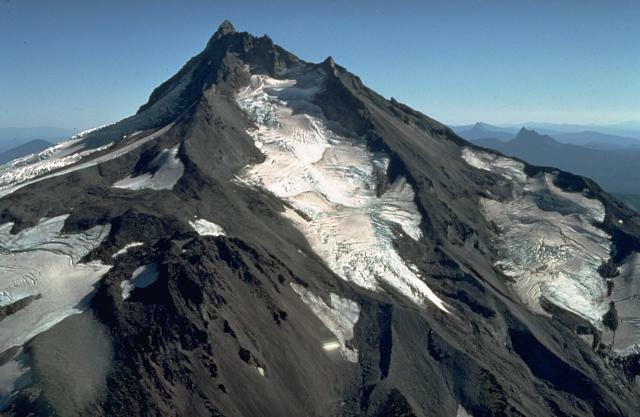 On the left skyline is the glacially eroded core of the Pleistocene Black Buttes stratovolcano, a predecessor to Mount Baker. From left to right, the Deming, Easton, Squock, Talum, Boulder, and Park Glaciers drape the volcano's flanks. Stratovolcanoes, also known as composite volcanoes, are built up by accumulated layers of lava flows and fragmental material from explosive eruptions. 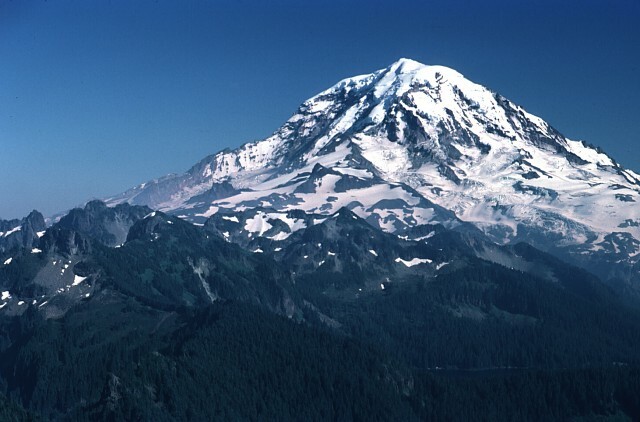 Glacier-clad Mount Rainier, seen here from the NW, is the most prominent stratovolcano in the Cascade Range. Most eruptions originate from a central conduit, which produces the common conical profile of stratovolcanoes, but flank eruptions also occur. Both isolated stratovolcanoes like Mount Rainier and compound volcanoes formed by overlapping cones are common. Photo by Lee Siebert, 1983 (Smithsonian Institution). 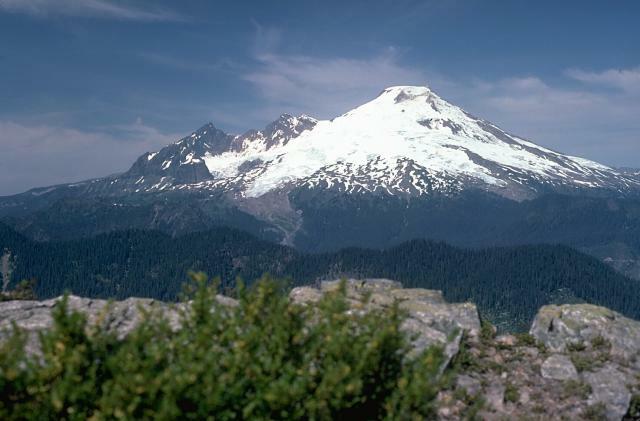 Sharp-topped Mount Jefferson stratovolcano has been inactive since the late Pleistocene and shows the effect of extensive dissection by glacial erosion. The Jefferson Park Glacier on the north flank in the foreground and the Whitewater Glacier on the east flank are the two largest on Jefferson. 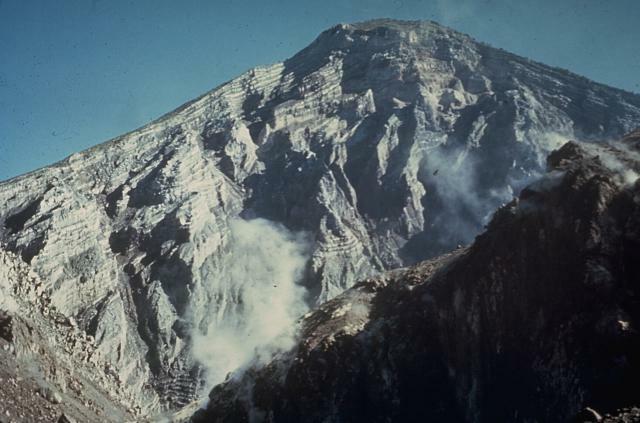 A steam plume blows from the summit of Mexico's Colima volcano in this 1992 view from the WSW with snow-capped Nevado de Colima to the left. 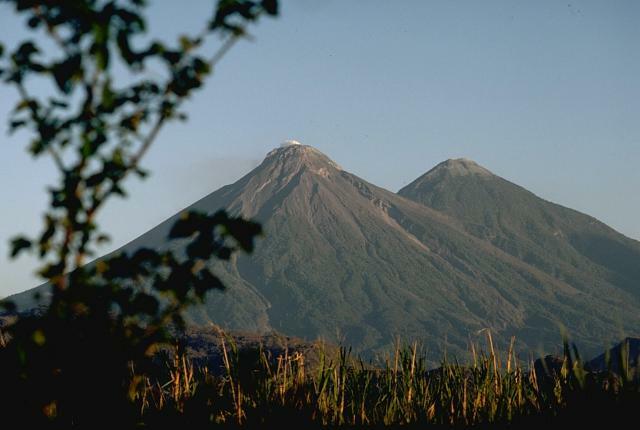 Colima, also known as Fuego de Colima, is one of North America's most active volcanoes. Frequent eruptions have been recorded since the 16th century. A complex succession of eruptions that has been dominated during the past century by lava effusion associated with lava dome growth has also produced explosive eruptions of varying magnitude and frequent pyroclastic flows. Photo by Jim Luhr, 1992 (Smithsonian Institution). 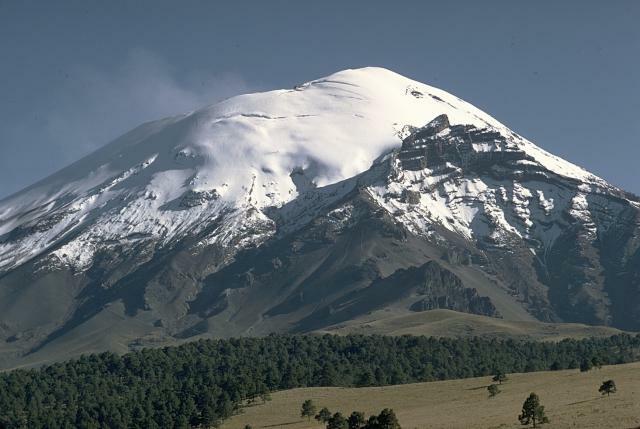 The snow-capped peak of México's Popocatépetl stratovolcano rises above Tlamacas to its north. Faint steam ascends from a deep elliptical summit crater, whose NE rim is 170 m below the summit. The sharp peak below the horizon at the right is Ventorrillo, the summit of the eroded Nexpayantla volcano, a predecessor to Popocatépetl. Its steep cliffs expose the stratified, layered interior of a stratovolcano. The interior of a stratovolcano is dramatically revealed in a 1-km wide crater created on the SW flank of Guatemala's Santa María volcano during an eruption in 1902. The 1200-m-high wall exposes thin, light-colored lava flows that are interbedded with deposits of fragmental material produced during growth of the volcano. The 1902 eruption, the first in historical time at Santa María, was one of the world's largest during the 20th century. 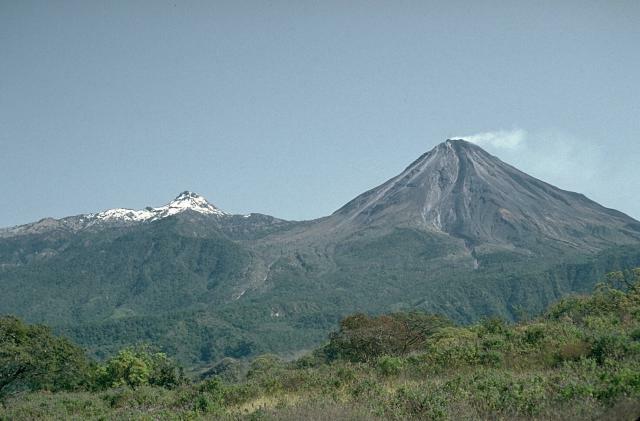 Fuego (left) and Acatenango are two of several paired volcanoes in Guatemala. Southward-younging volcanism constructed these two large stratovolcanoes and flank vents perpendicular to the trend of the Guatemalan volcanic front. The chemistry of lavas also varied progressively from dominantly andesitic at Acatenango to increasingly basaltic at Fuego. Activity from the Pleistocene-Holocene Acatenango has continued only sporadically into historical time, but Fuego is one of the most active volcanoes in Guatemala, with about 60 historical eruptions. 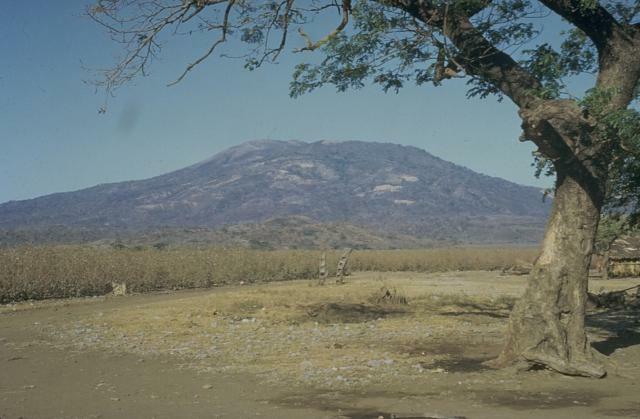 Las Pilas stratovolcano, seen here from the south, is the most prominent feature of Nicaragua's Las Pilas volcanic complex. Las Pilas barely exceeds 1000 m in elevation, but it towers 900 m above its base in the Nicaraguan depression only a few hundred m above sea level. Its broad 1088-m-high summit is cut by a 700-m-wide crater and by a N-S fissure formed during an eruption in 1952. There were no previously documented eruptions of this volcano since the arrival of Spanish explorers in the 1520s. Photo by Bill Rose, 1967 (Michigan Technological University). 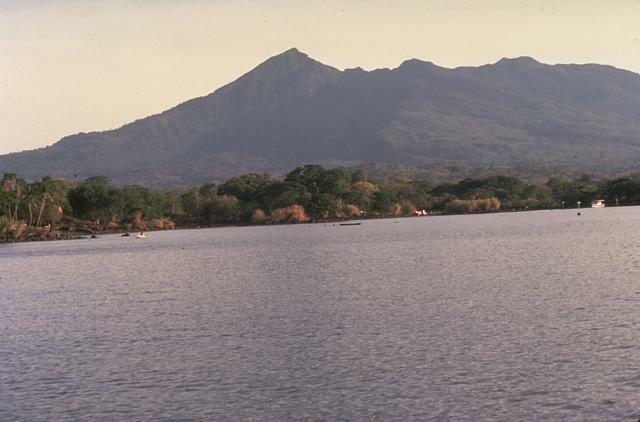 Mombacho is a stratovolcano on the shores of Lake Nicaragua that has undergone edifice collapse on several occasions. Two horseshoe-shaped craters cut the summit on the NE and south flanks, modifying the profile of the volcano. 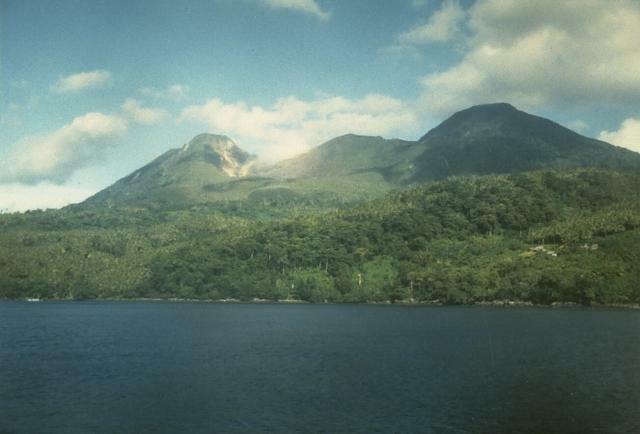 The NE-flank scarp, whose NE wall forms the left skyline, was the source of a large debris avalanche that produced an arcuate peninsula and the Las Isletas chain of islands in Lake Nicaragua. The only reported historical activity was in 1570, when a debris avalanche destroyed a village on the south side of the volcano.